This terrace, in buff sawn sandstone giving a contemporary feel, was designed to form an extension of the client’s newly fitted kitchen/entertaining room. The bi-fold doors now open onto an elegant space that has purpose-built areas for dining and seating. The rendered walls offer privacy and give an ‘outdoor room’ feel. Carefully positioned, horizontal slots offer tempting glimpses of the space beyond. The raised beds have simple planting schemes and also include illuminated sculptures that act as focal points. 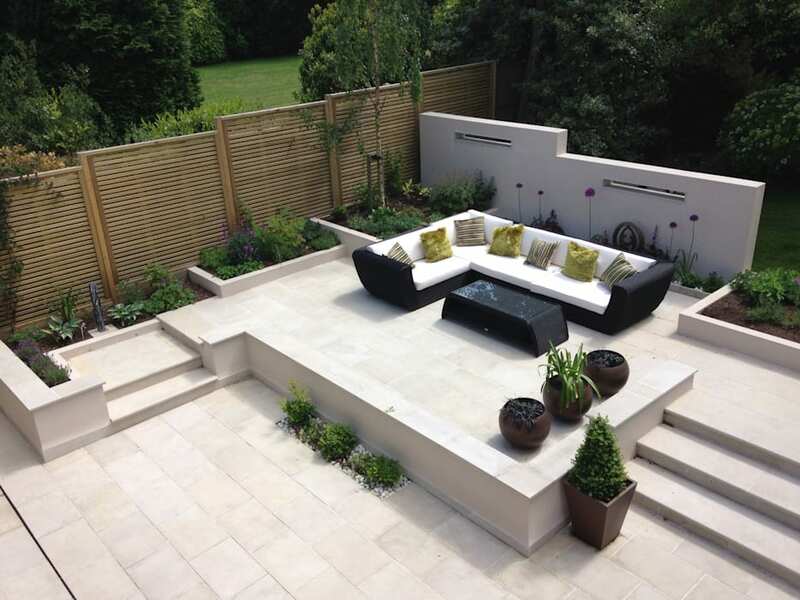 Large planters and a stone monolith water feature also give interest to this space. A subtle lighting plan highlights key features to give a pleasing view from the property at night.